This article is about the 2000 film. For other uses, see Castaway (disambiguation). 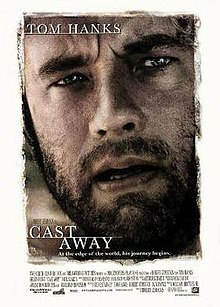 Cast Away is a 2000 American survival drama film directed and co-produced by Robert Zemeckis and starring Tom Hanks, Helen Hunt, and Nick Searcy. The film depicts a FedEx employee marooned on an uninhabited island after his plane crashes in the South Pacific and his attempts to survive on the island using remnants of his plane's cargo. In December 1995, Chuck Noland is a time-obsessed systems engineer who travels worldwide resolving productivity problems at FedEx depots. He is in a long-term relationship with Kelly Frears, with whom he lives in Memphis, Tennessee. Although the couple wants to get married, Chuck's busy schedule interferes with their relationship. A Christmas gathering with relatives is interrupted when Chuck is summoned to resolve a problem in Malaysia. While flying through a violent storm, his plane crashes into the Pacific Ocean. Chuck escapes from the sinking plane and is saved by an inflatable life raft, but loses the emergency locator transmitter. He clings to the life raft, loses consciousness, and floats all night before washing up on an island. After he awakens, he explores the island and soon discovers that it is uninhabited. Several FedEx packages from the crashed plane also wash up on the shore, as well as the corpse of one of the pilots, whom he buries. He initially attempts to signal for rescue and makes an escape attempt with the remnants of his life raft, but cannot pass the powerful surf and the coral reefs surrounding the island. He searches for food, water, and shelter, and opens the packages, making use of a number of items. He leaves one package, which has a pair of angel wings printed on it, unopened. During a first attempt to make fire, Chuck receives a deep wound to his hand. In anger and pain, he throws several objects, including a Wilson volleyball from one of the packages. Later, he draws a face in the bloody hand print on the ball, names it Wilson, and begins talking to it. One night, Chuck calculates that in order for the rescue workers to find the site of the plane crash, they will have to search an area twice the size of Texas, making his rescue unlikely. Four years later (in early 2000), Chuck has adapted to the island's meager living conditions, having become adept at spearing fish and making fires. He also has regular conversations and arguments with Wilson, his only means of socialization. A large section of a portable toilet washes up on the island; Chuck uses it as a sail in the construction of a raft. After spending some time building and stocking the raft and waiting for optimal weather conditions (using an analemma he has created in his cave to monitor the time of year), he launches, using the sail to overcome the powerful surf. After some time on the ocean, a storm nearly tears his raft apart. The following day, as Chuck sleeps, Wilson becomes untethered and floats away from the raft. Chuck is wakened by the spray of a sounding whale, sees Wilson, and swims after him, but Wilson has gone too far to be safely retrieved. Chuck returns to the raft and collapses in tears. Later, a passing cargo ship finds him drifting. Upon returning to civilization, Chuck learns that he has long been given up for dead; his family and acquaintances have held a funeral, Kelly has moved on and has since married and has a daughter. After reuniting, the pair profess their love for each other but, realizing they could not be together because of her commitment to her new family, they sadly part. Kelly gives Chuck the car they once shared. Some time later, Chuck travels to Canadian, Texas, to return the unopened FedEx package with the angel wings to its sender, a woman named Bettina Peterson. No one is home, so he leaves the package at the door with a note saying that the package saved his life. He departs and stops at a deserted crossroads. A friendly woman passing by in a pickup truck stops to explain where each road leads. As she drives away, Chuck notices angel wings on the back of her truck which match those on the parcel. As Chuck is left standing at the crossroads he looks down each road, then smiles faintly as he looks in the direction of the woman's truck. I made Cast Away because I wanted to examine the concept of four years of hopelessness, in which you have none of the requirements for living — food, water, shelter, fire and company. But it took us six years to put together the alliance that would actually examine that. I only had a third of it, and Bill Broyles only had a third of it, until Bob Zemeckis comes along and provided that other third. I had that original idea. I was reading an article about FedEx, and I realized that 747s filled with packages fly across the Pacific three times a day. And I just thought, "What happens if that goes down?" The film's shooting occurred between 1998 and 2000, but was not shot consecutively. Hanks gained 50 pounds (23 kg) during pre-production, for the purpose of making his transformation more dramatic. After a majority of the film was shot, production was halted for a year so that he could lose the weight and grow his hair and beard to look like he had been living on the island for years. During the year-long hiatus, Zemeckis used the same film crew to make another film, What Lies Beneath. Cast Away was filmed on Monuriki, one of the Mamanuca Islands in Fiji. It is in a subgroup of the Mamanuca archipelago, which is sited off the coast of Viti Levu, Fiji's largest island. The island became a tourist attraction following the film's release. After Chuck's return, it is identified by Kelly as being "about 600 miles south of the Cook Islands," but there is actually no land between the southernmost Cook Islands of Mangaia and Antarctica. The film essentially begins and ends in the same location, on the Arrington Ranch in the Texas Panhandle south of the city of Canadian, Texas. The film's minimal score was composed by Alan Silvestri for which he won a Grammy Award in 2002. The film's soundtrack is most notable for its lack of score and creature sound effects (such as bird song or insect sounds) while Chuck is on the island, which is intended to reinforce the feeling of isolation. Cast Away contains no original musical score until Chuck escapes the island. However, there is a Russian choral piece heard near the start of the film that was not composed or even recorded by Silvestri, so it does not appear on the film's soundtrack list. It is a traditional Russian song written by Lev Knipper called "Oh, My Field" ("Polyushko, Polye") and it is available on various collections of Red Army hymns. The official soundtrack CD is an anthology of musical pieces from all films up to that point directed by Zemeckis and scored by Silvestri. The only track from Cast Away itself is the theme from the end credits. FedEx provided access to their facilities (Memphis, Los Angeles, and Moscow) as well as airplanes, trucks, uniforms, and logistical support. A team of FedEx marketers oversaw production through more than two years of filming. FedEx CEO Fred Smith made an appearance as himself for the scene where Chuck is welcomed back, which was filmed on location at FedEx's home facilities in Memphis, Tennessee. The idea of a story based on a FedEx plane crashing gave the company "a heart attack at first," but the overall story was seen as positive. FedEx, which paid no money for product placement in the film, saw an increase in brand awareness in Asia and Europe following the film's release. 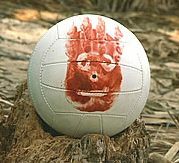 In the film, Wilson the volleyball serves as Chuck Noland's personified friend and only companion during the four years that Noland spends alone on a deserted island. Named after the volleyball's manufacturer, Wilson Sporting Goods, the character was created by screenwriter William Broyles, Jr. While researching for the film, he consulted with professional survival experts, and then chose to deliberately strand himself for one week on an isolated beach in the Gulf of California, to force himself to search for water and food, and obtain his own shelter. During this time, a volleyball washed up on shore. This was the inspiration for the film's inanimate companion. From a screenwriting point of view, Wilson also serves to realistically allow dialogue in a one-person-only situation. On Rotten Tomatoes, Cast Away has an approval rating of 88% based on 155 reviews, with an average rating of 7.36/10. The site's critical consensus reads, "Flawed but fascinating, Cast Away offers an intelligent script, some of Robert Zemeckis' most mature directing, and a showcase performance from Tom Hanks." On Metacritic the film has a score of 73 out of 100, based on 32 critics, indicating "generally favorable reviews". Cast Away opened in 2,774 theaters in North America and grossed $28,883,406 with an average of $10,412 per theater on its opening weekend. For the four-day Christmas long holiday weekend, it took in a total of $39,852,075. The film kept performing well and ended up earning $233,632,142 domestically and $196,000,000 internationally for a total of $429,632,142, well above its production budget of $90 million. A FedEx commercial during the 2003 Super Bowl parodied the final scene of the film, in which Chuck returns a package to its sender. In this version, the woman answers the door, and when Chuck asks what was in the box, the woman replies: "Just a satellite phone, GPS locator, fishing rod, water purifier, and some seeds. Just silly stuff." Media executive Lloyd Braun of ABC Studios first suggested the idea of a Cast Away–type television series at a dinner party in 2003. Thom Sherman later pitched the idea for Cast Away – The Series, but never developed the idea. The concept was later developed and pitched with the title Nowhere, which later turned into the ABC show Lost. ^ a b c "Cast Away (2000)". Box Office Mojo. January 1, 2001. Retrieved January 10, 2015. ^ a b "'Cast Away' Director Defies Categorizing". New York Times. 2000. Retrieved October 18, 2012. ^ a b Galloway, Stephen (November 30, 2017). "Actor Roundtable: Tom Hanks, James Franco and More on 'Predators Everywhere' and Secrets of 'Legends'". The Hollywood Reporter. Archived from the original on October 4, 2018. Retrieved December 8, 2017. ^ Carlson, Paul (August 2007). "Cast Away and the Texas Panhandle" (PDF). The Cyclone, Volume XIV, Issue 2. West Texas Historical Association. pp. 1–2. Retrieved January 2, 2015. ^ "Cast Away: The Films of Robert Zemeckis and the Music of Alan Silvestri". allmusic. Retrieved June 2, 2009. ^ "`Cast Away' Delivers Goods For Fedex". Chicago Tribune. 2001. ^ "Stranded: Behind-the-Scenes of Cast Away, A comprehensive behind-the-scenes look at Cast Away". Stumped Magazine. 2004. Archived from the original on July 16, 2011. Retrieved December 27, 2009. ^ "A look at some of the biggest hits in film and TV product placement". The Hollywood Reporter. April 28, 2005. Archived from the original on September 3, 2006. Retrieved November 25, 2007. ^ "Cast Away lets Hanks fend for himself". Detroit News. December 22, 2000. Retrieved November 26, 2008. ^ Nate Smith (January 7, 2001). "Cast Away proves great films still exist". Daily Gazette. Retrieved November 26, 2008. ^ Vanneman, Alan. "The Volleyball in the Void". Bright Lights Film Journal. Retrieved November 26, 2008. ^ Hepola, Sarah (December 29, 2000). "Lost at Sea and Back Again". The Austin Chronicle. ^ Natale, Richard (December 20, 2000). "Casting About". Los Angeles Times. Retrieved April 9, 2015. ^ "Wilson Cast Away Volleyball". Wilson Sporting Goods. Retrieved April 27, 2014. ^ "Cast Away". Rotten Tomatoes. December 22, 2000. Retrieved April 8, 2019. ^ "Cast Away". Metacritic. Retrieved April 9, 2015. ^ "Weekend Box Office Results for December 22-24, 2000". Box Office Mojo. Retrieved April 9, 2015. ^ "Weekend Box Office Results for December 22-25, 2000". Box Office Mojo. Retrieved April 9, 2015. ^ "The 73rd Academy Awards (2001) Nominees and Winners". Academy of Motion Picture Arts and Sciences. Archived from the original on April 14, 2012. Retrieved November 19, 2011. ^ Wolf, Matt (February 26, 2001). "'Gladiator' Gets 5 British Awards". Topeka Capital-Journal. Associated Press. Archived from the original on January 9, 2017. Retrieved October 9, 2013. ^ "The 6th Critics' Choice Movie Awards Winners and Nominees". Broadcast Film Critics Association. Archived from the original on January 4, 2012. ^ "Why no matches in the FedEx box? : FedEx parody commercial makes deliberate decision not to help provide fire to its own castaway". CNN. January 27, 2003. Retrieved March 4, 2012. ^ a b c "Cast Away". Chicago. August 2007. Retrieved December 27, 2008. Wikimedia Commons has media related to Cast Away.